Whilst attempts may be made to manage these challenges, we would submit that the practical difficulties they present are an integral part of the traveling circus and therefore cannot be completely eradicated. In the next section we discuss the scientific evidence on the effects of transport and captive accommodation in a range of species. A traveling circus will generally spend between a few days at a particular location, although occasionally a little longer. Such time constraints limit the type of accommodation and exercise facilities that can be made available to the animals. The nature of the traveling circus is such that most of the year is spent on tour; this is the primary source of income. Thus, circus animals are forced to live for the majority of the year in portable facilities. A circus needs to be able to set up and dismantle accommodation on a weekly basis – caging and fencing therefore needs to be collapsible, small, and relatively lightweight. Thus, the very nature of the business sets restrictions on animal facilities that can be provided. 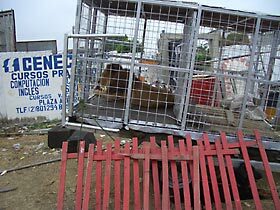 Even when circuses are moving from arena to arena (or other fixed venue), all of the animal and human living facilities, and process up setting up a business and show in new location still have to be considered. The character of the site available can also have an impact on animal welfare, e.g. car parks, fields, wasteland. Animals picketed on concrete or tarmac will suffer a poorer environment than those in a field. Furthermore busy town centre activity can add to the circus noise, light, visitors and vehicles that can constantly disturb animals attempting to rest in their accommodation. Welfare issues may also be raised by the proximity of incompatible species, for example predators in sight of prey species. Such compromises can be difficult to avoid in small spaces. Whilst it might be argued that if an unlimited number of large vehicles were available, large and complex animal environments might be made portable it has to be considered that this would involve a further welfare cost, as the animals would need to spend longer waiting to be unloaded whilst more extensive and complex enclosures and caging are erected. On a regular, often weekly, basis animals must be loaded onto transporters and driven to a new location. A common circus routine can involve animals being loaded in the late afternoon on a Sunday and remaining in their transporters until the remainder of the tents and equipment are packed and loaded, the circus driven to a new location, and unloading may not take place until the next morning or even afternoon. (ADI observations). It is inevitable that some animals will become sick or injured during the touring season. Some animals will travel whilst pregnant, and some will give birth on the road. At best sick or injured animals face a long journey back to the permanent quarters to recover, but it is more likely that circumstances will dictate that the animal must continue the tour. The nature of the business dictates extended periods in transporters and confinement for animals due to the need to load up, dismantle cages, tents and equipment for travel, combined with the time taken to re-build tents, cages and enclosures before unloading animals on arrival at the new fixture. The observation data demonstrates that even a very short journey can entail several hours in a transporter. This extended confinement can give rise to potential for suffering. 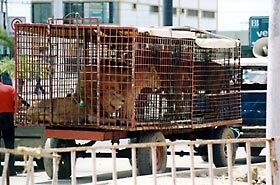 During an average performing week on tour, animals need to be moved from their living quarters to the circus ring to perform twice a day. This entails often moving large and potentially dangerous animals across open ground. This activity gives rise to two key factors that can result in suffering to the animals caused by workers (who are not necessarily show presenters or animal trainers); (a) the need to get animals into the ring on time, and (b) the need to keep them moving and prevent the animals identifying an opportunity for escape. For example, generally, groups of elephants are led (or chased) through the encampment to the big top, again quickly so as minimize the risk of their being out in the open for too long. Although some animals that are well versed in their routine, e.g. single elephants, camels, etc., can appear calm, without close control and discipline, any minor event or sight of something unusual can cause a panic or stampede. Animals of non-domesticated species traveling with circuses have not been bred over generations for compliance and their wild nature can make them unpredictable. Thus animal movement around the circus is commonly accompanied by shouting, banging bars, threatening, hitting and whipping by the handlers. The nature of a traveling circus, with the concomitant restrictions on cage sizes and other limitations, creates an environment where the basic welfare needs of the animals cannot be adequately met. Time pressures of performances and public safety issues when the animals are being moved about can give rise to animal suffering.